a.k.a. Dio, sei proprio un padreterno! This is also known by a host of other names, including: Frank and Tony, (as at right) Power Kill, The Cold Arms of Death and Escape From Death Row. And those are just the English-language titles. This is never normally a good sign. I’ve found it’s often used by unscrupulous DVD retailers, to sell the same movie in a number of different packages. However, this manages to take the over-familiar trope of the “mismatched buddies” and, despite being over 40 years old, does a better job of keeping it fresh than many, more modern films. The two here are Frankie Diomede (Van Cleef) and Tony Breda (Lo Bianco). Frankie is a mobster at the top of Italian crime, whose position is under attack from a rival gang under Louis Annunziata (Rochefort). The latter is a wannabe wise guy, whose knowledge of organized crime is largely obtained from classic movies. His long-suffering girlfriend, the enchantingly-named Orchidea (Fenech), has had it up to here with his dreams, but sticks by him regardless. Tony stalks Frankie and ends up sent to prison with him after being swept up in a raid on an illegal casino. In an interesting twist, the raid was actually deliberately caused Frankie. For he’s spirited out of jail by a corrupt cop, to deal with an treacherous associate, before returning to his cell. [It’s a mix of really smart – no many more iron-clad alibis than “I was in jail at the time!” – and kinda dumb. That’s why you have minions, so you don’t get your hands dirty] Unfortunately, Annunziata gets wind of the scheme, finds the cop, and Frankie ends up in jail. Tony is still trailing along like a low-level mobster puppy, but helps save Frankie’s life, and when he gets out, agrees to carry out a plan that will break Frankie out as he’s being transferred to a different facility. While this succeeds, it’s clear Frankie has no interest in going back to the way things were. Even in prison, if he was going down, he was going to take everyone with him, and now he’s going to take the war to Annunziata. Not even discovering that his rival’s headquarters are across the border, will stop him. Tony, meanwhile is delighted, since he’s now a real gangster’s henchmen. 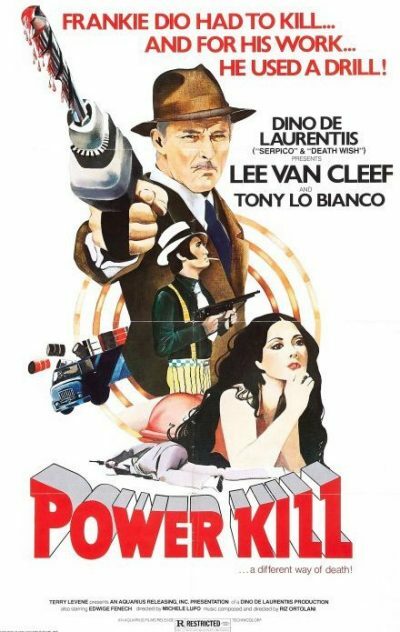 However, as the body count starts to mount, he’s discovering that the gap between cinematic mobsterdom and the real thing, is quite disconcerting. Considering this is actually an example of the former and not the latter, it’s quite a spectacularly meta mindset. It’s the two lead characters that make this work. Kinda disconcerting to realize that Van Cleef was actually younger than I am when he made this, since he looks like he should be yelling at kids to get off his damn lawn. Except, that would involve too many words, for a character whose middle name appears to be “taciturn.” Still, there’s no denying he kicks an extraordinary amount of arse here, and also wields an electric drill with disturbing enthusiasm. 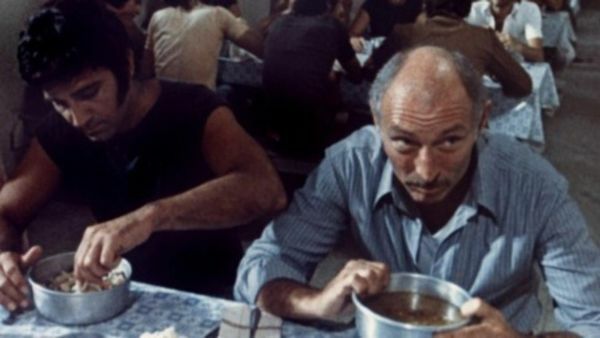 Lo Bianco, whom I remember seeing previously only in Larry Cohen’s slab of religious insanity, God Told Me To, is equally as good playing the foil to Van Cleef’s straight man, and despite the disparity, the pair have an easy chemistry that’s enjoyable to watch. Lupo and cinematographer Joe D’Amato handle the action sequences effectively, particularly a prison brawl, and the lengthy chase after the pair hijack an oil truck and crash through the border. The latter isn’t exactly a complimentary portrayal of the French police force though. There is an over-reliance on one of the cues in Riz Ortolani’s score, which seems to show up every 30 seconds, as if by clockwork, and I could have done with more Fenech, who is sadly under-used. Still, it’s a load of fun, and surprisingly touching at the end, when Frankie gently lets his buddy know he’s not cut out for a violent life of crime. At least he’ll always have Edwige.